I usually tackle these things spontaneously when I get frustrated or motivated enough to just get them done quick! I apologize for the gross hair on all my brushes in advance, but real life right?? As you can see, the top one has all hair accessories, but the bottom one was just a mishmash of a bunch of random things with no rhyme or reason to it! Teeth whitening kits, products samples, body butter, face masks, etc. 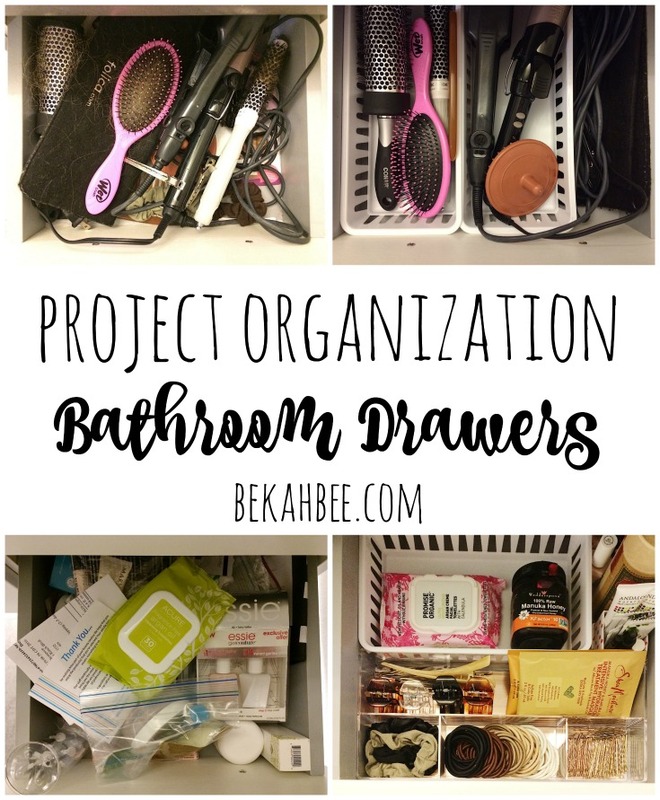 This project was really inexpensive at just under $15, and would have been even cheaper if I hadn’t fallen in love with that rose gold and acrylic organizer from Target which was $11. I thought it was worth it since it’s so pretty, and I loved that it had smaller divided sections for my hair accessories. (It’s actually a desk organizer) All the white baskets were only $1 each at HEB. 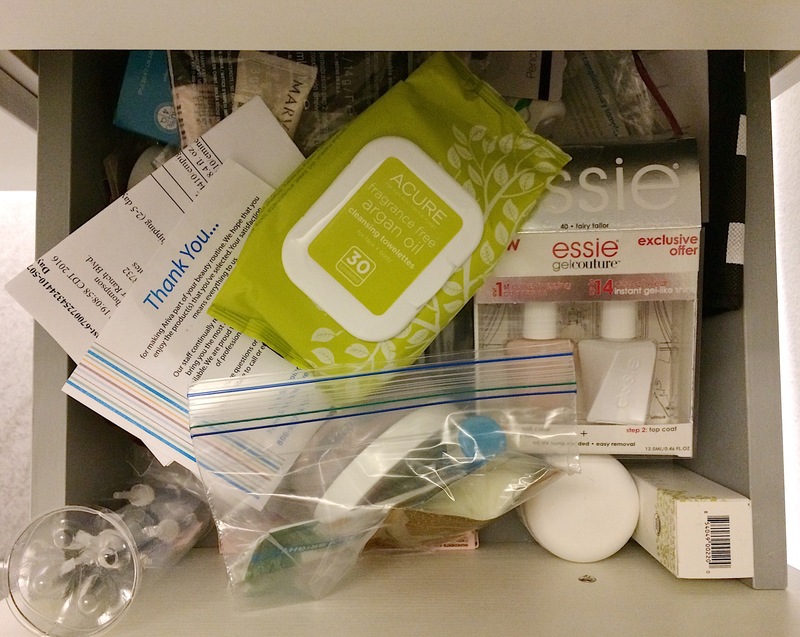 So, I started by thinking about how I use this space and these drawers every day when I’m getting ready and the things I wanted to be able to grab quickly. 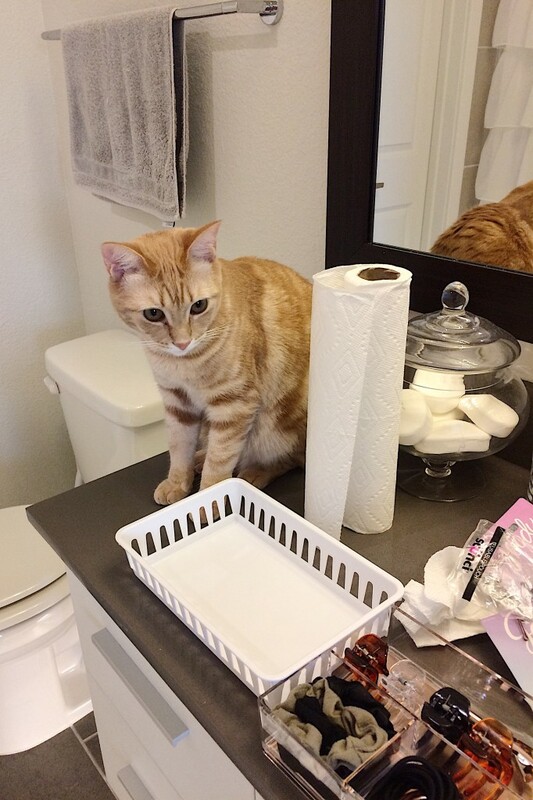 As always, my trusty sidekick Milo was at my side, being my helper! 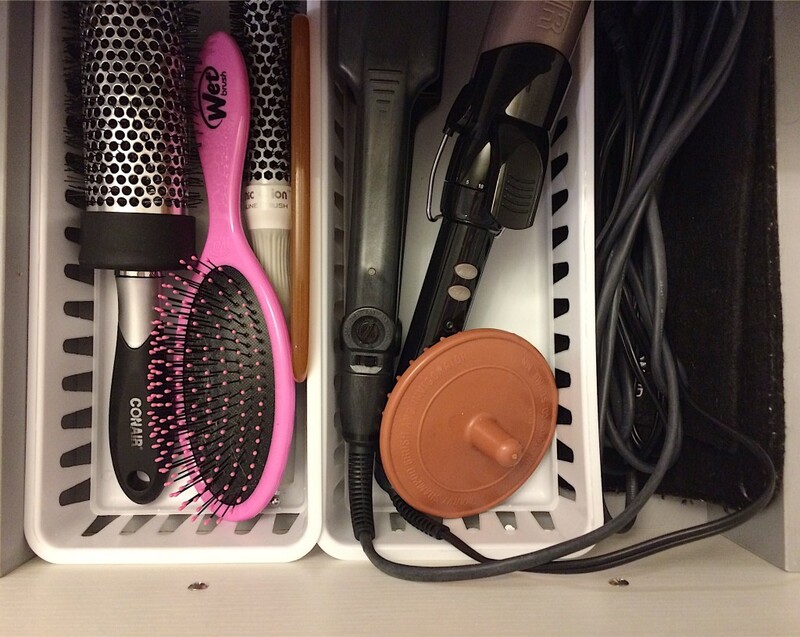 On the left, I put all my brushes and combs, and on the right my hair tools and scalp massager. I needed to leave a space on the very right for the cords and heating pads for the hot tools. 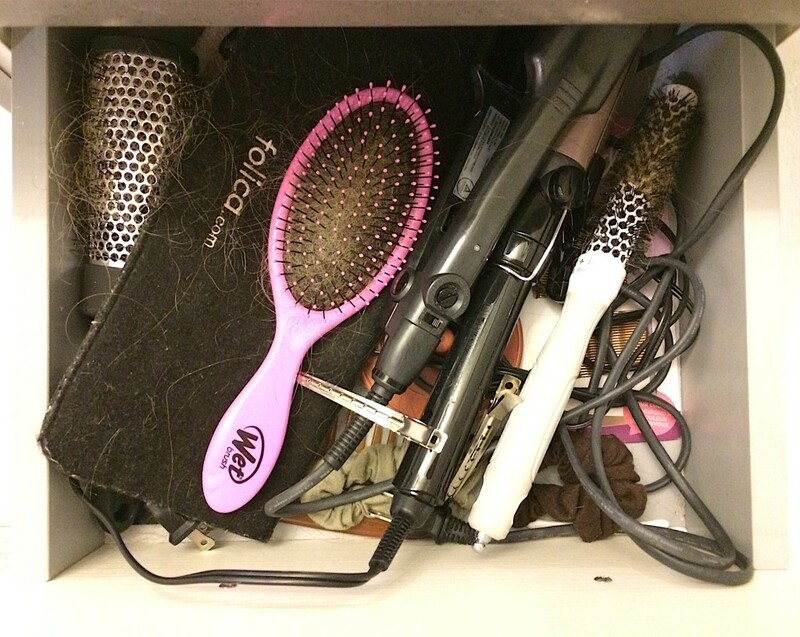 I wanted to be able to just throw them back in here after I style my hair. 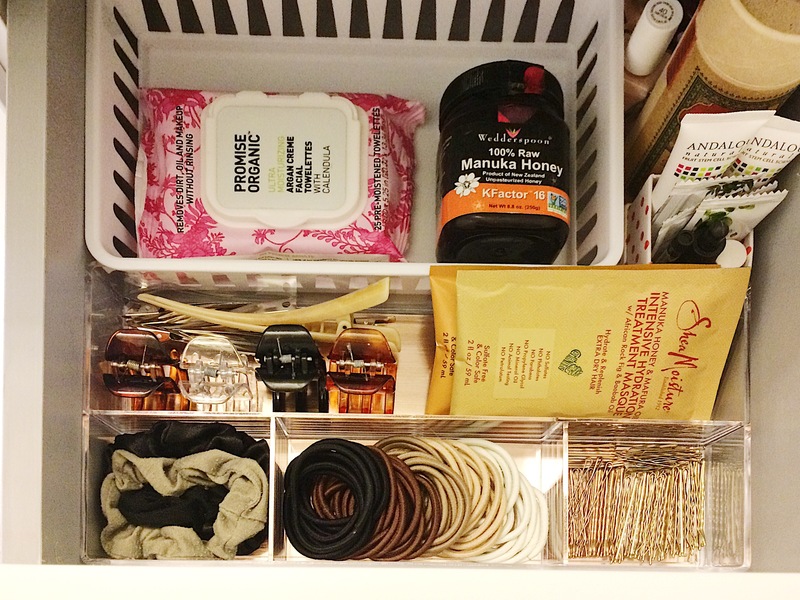 I decided to make this drawer the home for all my hair ties, scrunchies, clips and pins. I also bought some new hair ties and bobbie pins since mine are constantly disappearing into thin air, no matter how many I start with! Haha. Does that happen to you too? I also have my deep treatment hair masks and dry shampoo, a few sample size items and nail polishes in the very back. And then I put one basket in here for my makeup removal wipes which I use at night and the honey I use to wash my face on some days. I feel like it all worked out pretty well and so far has been pretty easy to keep neat and suits my needs well! Man, organizing and purging is so cathartic! Do you agree? I feel like I can take on the whole world when I have tackled each space! 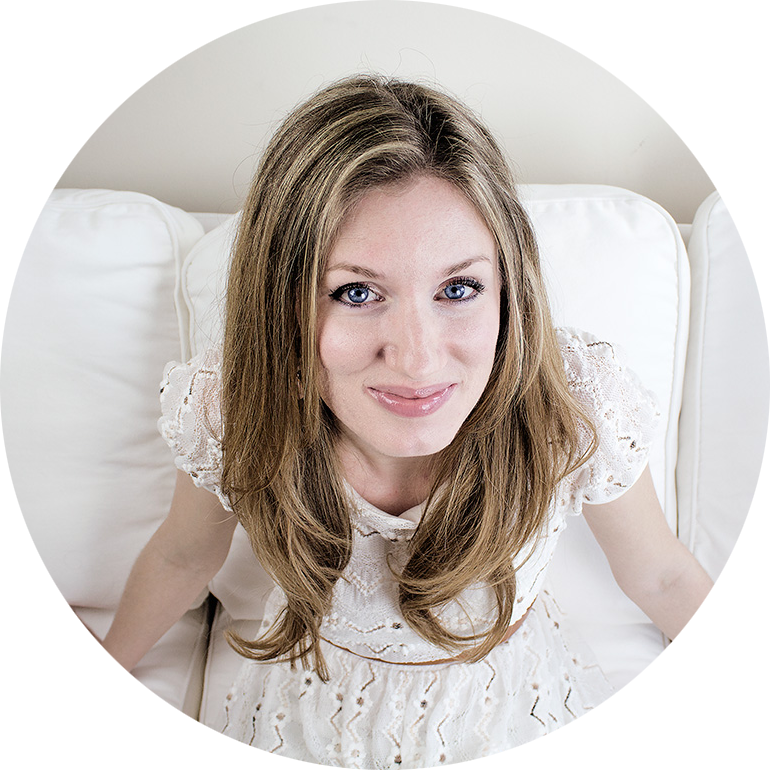 Do you all have any special rituals you do to make organizing projects even more fun? For me, it’s listening to upbeat music or maybe a podcast and just enjoying the company of my Milo boy!